The title of the core or collection is found here. Displays the language of the core or collection. You'll find the name of the core or collection here. You can see how many documents are included in the collection here. Click on this button to update outdated or all cores and collections, respectively, if, for example, the Solr Server was offline and applications were modified in the meantime. 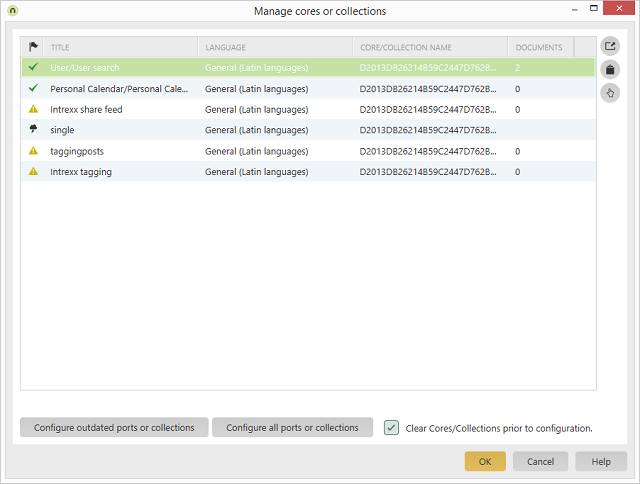 Deletes the content of the cores/collections before performing the configuration. Configures the core or collection that's currently selection. Copies the name to the clipboard. Opens the administration website from Apache Solr. Further information about this topic can be found here.